The Genre of the Plot Device indicates how it is used in game play. a unique name that identifies the card as part of the WAGON collection. The black Bandwidth Icons indicate how much Bandwidth must be paid in order to play the card. The source webcomic that is this card's inspiration. This can either be the name of the comic itself or the comic's URL. All cards carry up to 3 Attributes, which help discribe the qualities of the content such as being able to Fly, being an Animal, or being connected to the Water. The ability of the Plot Device, what it does when it's in play. Permanent Plot Devices are placed on your Plot Device Line and will remain there until they are discarded, they are destroyed, or they meet whatever qualifiactions they call for are reached to remove them from gameplay. Many of these Plot Devices have playingfield-wide effects from anything like giving all Fighter Genre Characters a bonus to their Offensive Power to preventing any cards with Water Attributes from being brought into play. While it's a very good thing to have a few of these in play to help your strategy be more effective, remember that you can only have 5 Plot Devices in play at once so you'll want to be careful not to leave yourself unable to play a new card when it's needed. Counter Plot Devices work very similarly to Permanent Plot Devices, except they only stay on the field for a certain number of rounds. The number indicated on the Plot Device's Genre Icon lets you know how many rounds that card can stay on the field. Remember that the first part of taking your turn is the 'Advance Phase', which is where the counter on these cards is moved 1 count closer to zero. When the Counter Plot Device reaches zero, it must be discarded from the field. Until that counter runs out though, the Plot Device's effects remain active on gameplay, so if these cards are giving you a bonus you'd better take advantage of it before it runs out! Equipped Plot Devices are objects or items that are attached directly to one of your Characters. To use Equipment, simply place the Plot Device with the Character you're giving it to and they will benifit from it's effects. A Character may only have 1 Equipment Plot Device equipped to them at once, though they can still be effected by Counter or Permanent Plot Devices at the same time. You may discard the Plot Device if you wish, but only at the end of your turn. If the equipped Character is ever permamently removed from the field (sent to the discard pile, back to your hand. etc.) the attached Plot Device is automatically discarded. Characters that are set aside from gameplay temporarily (hiding, moved to the Plot Device line, etc. ), the Plot Device remains attached to the Character. Instant Plot Devices are quick rapid-fire events that are meant to catch your Opponent unaware, like an unexpected plot twist to spring on your audience. These cards are played during you or your Opponent's 'Action' Phase... but your Opponent can also play them! This means that when the action phase starts for either player, you and your Opponent are both free to toss some Instant Plot Devices into gameplay in order to mess with strategy. Much like other cards though, both you or your Opponent may each only play 1 copy of any Instant Plot Device during any particular Action Phase. These Plot Devices do not remain on the field, and so do not count towards your 5 Plot Device limit. Can only be used by Genre Characters. The Equipped Character gains a +1 OFF Bonus. (or Boosted Characters) of the Fighter Genre, it can give them a +1 to their OFF Power while they have it. 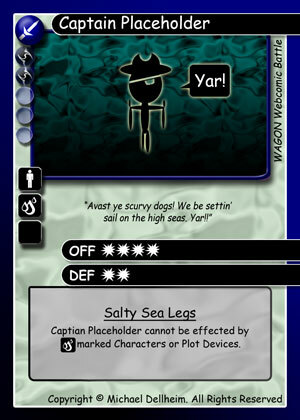 So in the set up below, we'll Equip the Beating Stick to our friend Captain Placeholder by placing it under him. We have here another Plot Device Called "Lime Rootbeer"
add a counter to this card. at any time as if they were . With Lime Rootbeer on the field, Bill suddenly gains a +1 to his OFF Power, making his OFF 6. 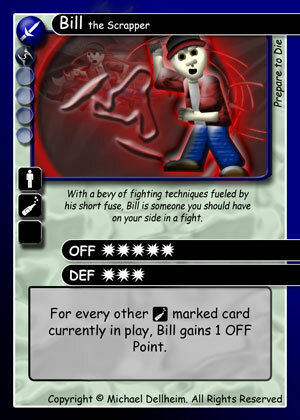 With Bill's newly higher Power, Captain Placeholder is sadly destroyed by Bill's next attack, which was made possible by the card that he himself played. The only consolation is that when Captain Placeholder is destroyed it adds a counter to Lime Rootbeer, which can be used to help you play new Characters to replace him more quickly. This sequence is an example of how a Plot Device can not only help you, but can also hurt you depending on how they work together with certain Characters. Being aware of the special abilties of all the Characters on the field can be extremely important in planning your strategies.